Super Smash Bros Brawl for Wii. This item is genuine, original. No Instructions. Super Nintendo. If you are not happy with it we will work to fix the problem. Just let us know. New Super Mario Bros. Wii for Wii. This item is genuine, original. No Instructions. Super Nintendo. If you are not happy with it we will work to fix the problem. Just let us know. Nintendo 64. Wii Fit (Nintendo Wii, 2008). Console: Nintendo Wii and Nintendo Wii U. (1) original instruction booklet. Mario Kart Wii for Wii. This item is genuine, original. No Instructions. If you are not happy with it we will work to fix the problem. Just let us know. Nintendo NES. Nintendo DS. Nintendo 64. Super Mario Galaxy 2 for Wii. This item is genuine, original. No Instructions. Super Nintendo. If you are not happy with it we will work to fix the problem. Just let us know. Nintendo DS. Nintendo 64. Wii Fit Plus Nintendo Wii. LEGO Batman 2 for Wii. This item is genuine, original. No Instructions. If you are not happy with it we will work to fix the problem. Just let us know. Nintendo NES. Nintendo DS. Nintendo 64. Game is complete. Please see pics for any imperfections. Disc has many scratches but played well when I tested it. Teenage Mutant Ninja Turtles for Wii. No Instructions. This item is genuine, original. If you are not happy with it we will work to fix the problem. Just let us know. Nintendo NES. Nintendo DS. Nintendo 64. Spyro The Eternal Night for Wii. No Instructions. How long will my order take to arrive?. This item is genuine, original. They arenot included in the listed price. If you are not happy with it we will work to fix the problem. LEGO Star Wars Complete Saga for Wii. No Instructions. This item is genuine, original. How long will my order take to arrive?. They arenot included in the listed price. If you are not happy with it we will work to fix the problem. Disc is in great shape, plays fine. Complete with case and manual. We are always happy to work with you to help resolve any issues that may arise or slip our notice! Wii Sports for Wii. This item is genuine, original. No Instructions. If you are not happy with it we will work to fix the problem. Just let us know. Nintendo NES. Nintendo DS. Nintendo 64. Wii Sports Resort for Wii. This item is genuine, original. No Instructions. If you are not happy with it we will work to fix the problem. Just let us know. How long will my order take to arrive?. Super Nintendo. Cooking Mama Cook Off for Wii. THE PHOTO SHOWN IS AN EXAMPLE. YOUR ITEM WILL BE SIMILAR BUT MIGHT NOT MATCH EXACTLY. This item is genuine, original. If you are not happy with it we will work to fix the problem. No Instructions. THE PHOTO SHOWN IS AN EXAMPLE. YOUR ITEM WILL BE SIMILAR BUT MIGHT NOT MATCH EXACTLY. This item is genuine, original. If you are not happy with it we will work to fix the problem. THE PHOTO SHOWN IS AN EXAMPLE. YOUR ITEM WILL BE SIMILAR BUT MIGHT NOT MATCH EXACTLY. This item is genuine, original. No Instructions. If you are not happy with it we will work to fix the problem. Console: Nintendo Wii and Nintendo Wii U. There is a small triangle cut from the top right corner of the plastic cover. There is a triangle cut from the top right corner. I will make every effort to make things right. Console: Nintendo Wii and Nintendo Wii U. I will make every effort to make things right. Condition: Used, but still works! No Instructions. This item is genuine, original. If you are not happy with it we will work to fix the problem. Just let us know. They arenot included in the listed price. How long will my order take to arrive?. This item is genuine, original. No Instructions. If you are not happy with it we will work to fix the problem. Just let us know. They arenot included in the listed price. THE PHOTO SHOWN IS AN EXAMPLE. Super Mario Galaxy: Nintendo Selects for Wii. Nintendo 64. Nintendo DS. Nintendo NES. This item is genuine, original. Super Nintendo. No Instructions. If you are not happy with it we will work to fix the problem. Call of Duty 3 For PAL Wii-Original Seal (New & Sealed). Condition is New. Dispatched with Royal Mail 2nd Class Large Letter. 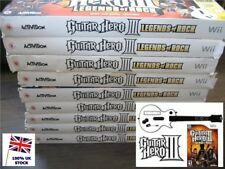 You've got to beat the best, to be the best - Battle mode lends itself to the boss battles featuring Slash and Tom Morello. Crank it up to 11 and get ready to rock - Featuring over 70 percent master recordings over 40 years of music. 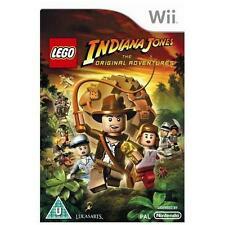 LEGO Indiana Jones: The Original Adventures (Wii). Title:LEGO Indiana Jones: The Original Adventures (Wii). General Interest. Your item will be previously owned but still in great condition. The disc will play perfectly without interruption and the case, inlay notes and sleeve may show limited signs of wear. Condition Is Used Like New. Mario Kart Original steering wheel #black Special Edition. Language is German. Pattern picture! Item may differ from the photo. The Konsolenkost-Team wishes you a lot of fun. boxed, used. Item may differ from the photo. LEGO Indiana Jones - The Original Adventures. Nintendo Wii. Nintendo Wii Konsolen. Nintendo Wii Spiele. Nintendo Wii Zubehör. Nintendo Wii U. Nintendo Wii U Spiele. Nintendo Wii U Zubehör.